The One-Straw Revolution is one of the foundational texts of the permaculture movement. The author, Masanobu Fukuoka, was a Japanese farmer-philosopher who questioned the transition to “modern” farming methods. However, Fukuoka did not desire to return to traditional Asian farming practices, which were sustainable but highly labor intensive [as excellently documented in Farmers of Forty Centuries]. Instead, he wanted to come up with a new system, where the farmer worked with nature, instead of against it. Fukuoka determined that plants left to their own devices and produce food. Without plowing and chemicals, the soil will improve its own fertility. Masanobu Fukuoka grew up on a farm in Japan in the pre-war period. At the time, Japan was rapidly industrializing as the empire began to expand. There was a great interest in new, scientific farming methods which were becoming popular in the West. This included both mechanization and modern agricultural chemicals. On top of this, a biological exchange was still taking place, with new crops and pests from the Americas. Japan’s soil, which was well preserved by millennia of traditional farming practices, had begun to degrade rapidly under the heavy plow. Upon completing college Fukuoka got a job as a crop scientist, studying fungus in rice. Though he was successful in the field and having fun in the city, he began to feel his life was incomplete. At age 25, he had a revelation about the limitations of human knowledge, and abruptly resigned his position as a research scientist. Like a classic philosopher, Fukuoka began to wander Japan in meditation. Once, he stopped for a long period of weeks to spend his time staring at the sea. After this, he began challenging people with his conviction that, “everything is meaningless and of no value, and that everything returns to nothingness.” Like all great philosophers, he was almost universally dismissed as an eccentric by those he encountered. And like those who practice alternative agriculture, he would hear that for the rest of his life. Fukuoka’s spent World War II out of combat, but dreaming of the day he could go back to take over the farm. When he did, he began formulating his “do-nothing” farming method. Instead of trying new techniques over time, Fukuoka worked backwards, removing activities he deemed unnecessary. Over time, he developed a fully natural farming method. This method involves no plowing and weeding, fertilizing, spraying, or many of the other “essentials” of conventional farming. Fukuoka went as far as to even end crop rotation, something unthinkable to many natural farmers. Fukuoka’s biggest innovation was the discovery that destroying old rice straw is wasteful and unnecessary. In traditional Japanese farming the rice straw was burnt to prevent disease. At times, the practice was government mandated. Fukuoka found that old rice stalks nourish fields, and that a healthy field left alone will not develop disease. Unlike some other no-till systems, he would hand seed into the standing grain a few weeks before harvest, adding crucial time to the growing season. This system does not use any man made compost but instead relies on natural processes breaking down organic matter in the fields. 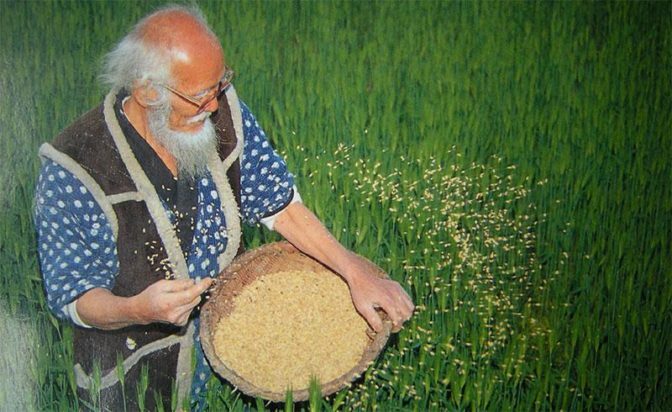 Despite doing almost nothing but planting seeds and harvesting, he managed to get some of the highest yields seen in Japan. 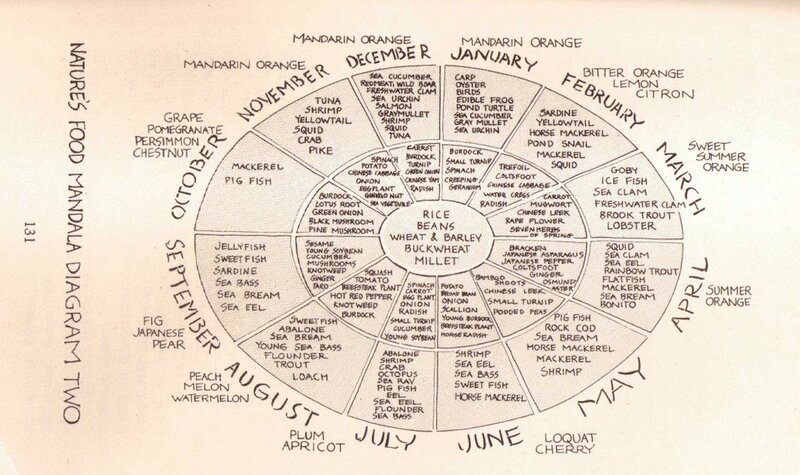 It almost beggars belief: if natural farming is this productive, how did conventional farming develop? Fukuoka achieved almost complete self-sufficiency on his farm, bringing in little from outside but cooking oil. He believed in eating a simple, seasonal, and rough diet of primarily rice and vegetables. One of the farm’s main exports was citrus. The citrus trees were planted with adequate space and left completely unpruned, except for removing dead wood. Fukuoka explains that cutting a single bud with scissors can disrupt a trees pattern and introduce disorder, which can lead to branches overcrowding and inviting diseased. An untouched tree knows where all the leaves need to go, and places them so that everything gets proper sunlight. The vegetables on the mountain farm were spread throughout the orchards in a random fashion. This is not efficient for large scale export production, but is great producing one’s own food. For the most part, once the vegetables have been established they are left to thrive, and it is only a matter of harvesting them here and there as they are ready. In this fashion, Fukuoka and his student-farmers were able to produce enough food to live happy and simple lives in harmony with nature. The One Straw-Revolution is a truly revolutionary text. It is easy to see why so many sought out Fukuoka’s wisdom on his bucolic mountain farm. Far better than most, he was able to see the soul sickness created by the modern world and how it paralleled the environmental degradation caused by industrial society. Fukuoka saw a different way, where man can live in harmony with nature- and let nature do the farm work; his wisdom on farming, nature, humanity, and society are timeless.